You guys, I’m sick of [not quite] seeing a particular spoiler. Q: What is your mother, Alex? Anyway, we had a simple situation heading into Final – but then Craig got $800 back during the break, throwing everything into the Twilight Zone. If Sally doubles her score, she’ll have 19,400. 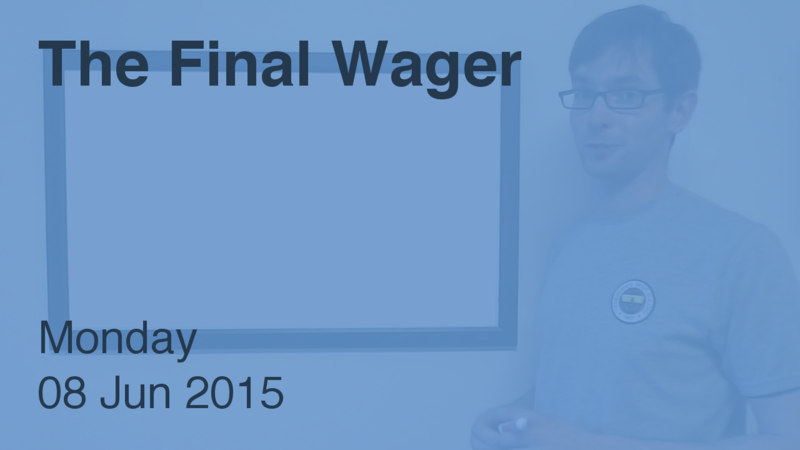 To cover this all-in wager, Chris will need to wager 5,200. An incorrect response with that wager will leave Chris with 9,000. To stay above his total, Sally can wager up to 700. But, more importantly, 9,000 is Craig’s score – which puts us into the same scenario as the first semifinal of 2014 TOC. A successful doubling will put Craig at 18,000. To cover this, Sally should wager at least 8,300. In this case, though, she will lose on an incorrect response, so she might as well wager everything – in fact, she should, just in case Chris goes for the tie. Chris could wager 3,800. If Craig is scared of that, he could wager everything. 5,200 ! 699 ! 0 ! 5,201 8,999 9,700 ! 9,000 ! Given Sally’s poor Daily Double wager in the first round, I would have gone for the tie. It would have worked out for me, although she was aggressive here. Either way, Chris has now won 2 games and $36,600 – and he breaks the one-week cycle of single-day champs. Who is Dulcinea (of Don Quixote)? Chris should wager 3,800 exactly: if Sally wagers 700, she will have 10400, and to stay above that Chris will have to wager no more than 3,800. Thus, Sally should wager 700 exactly. This makes Craig’s zero even more viable. I feel like Chris should have gotten orange. Also, whatever happened to pink wagers? I’ve just been in a sour mood lately – hence, no pink, just red. The general assumption is 5 games guarantees you a TOC berth (assuming good behavior), but there’s nothing that spells that out.